Finally after some extremely cold days the sun is shining & day by day I can feel that touch of spring on my skin. So looking into symbolisms of spring I have chosen the palette of a sweet canary to work on this week. It presents a variety of warm greys with a happy contrasting touch of yellow. Inspired by the colour of nature here are some ways to create a canary effect in your living, dining or bedroom & for those feeling free, canary yellow can be everywhere! 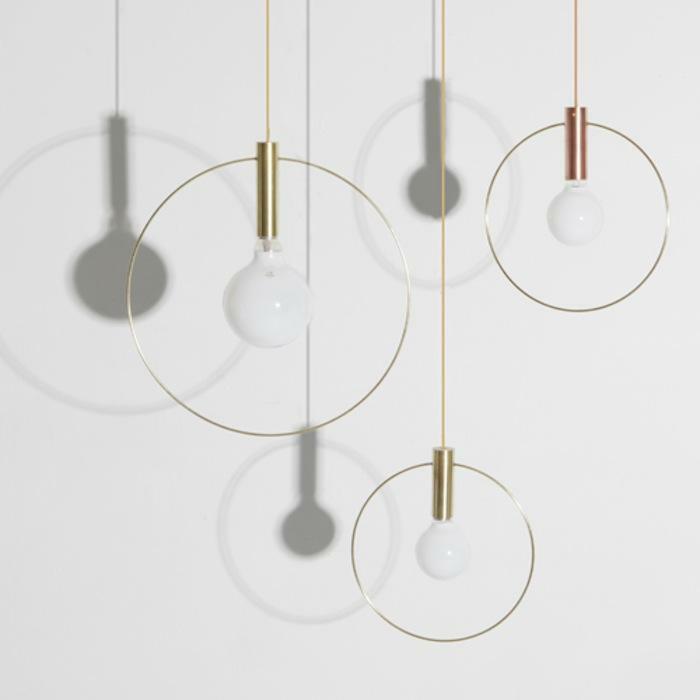 Aura: Hanging lamp by Ladies & Gentlemen. NABUCCO 2: Wall covering by Armani/Casa. Sesann: Three seated upholstered sofa by Tacchini. 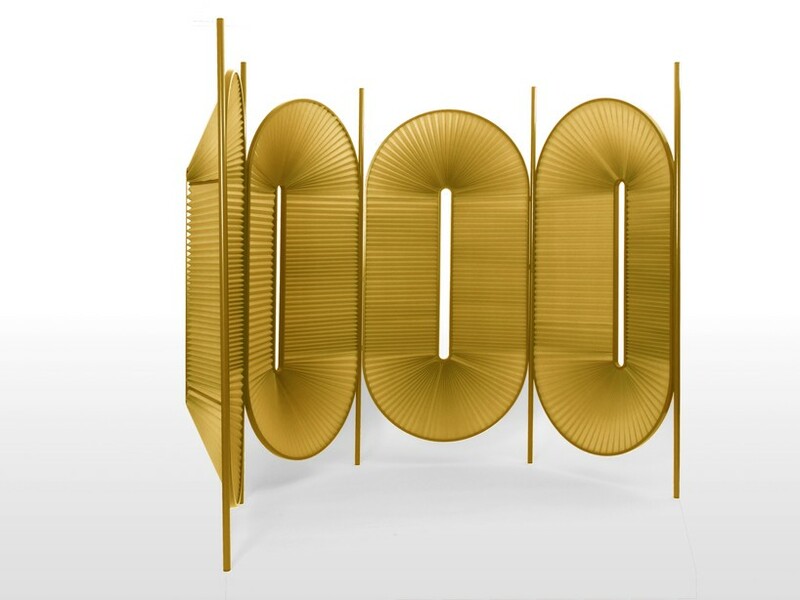 Minima Moralia: Room Divider by Dante-Goods And Bads. Tables: Marble & brass coffee table by Thierry for Campbell-Rey. RBS: Vase series made of resined sand by Steven Haulenbeek. 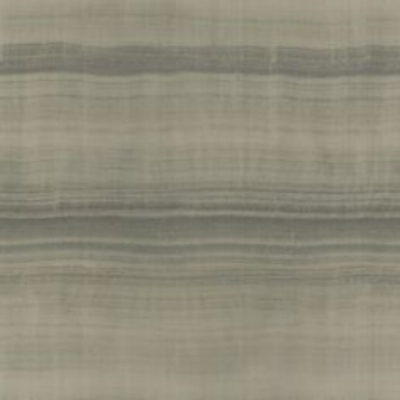 Nouvelles vagues Col4 - Tiger eyes: Textile by DEDAR. Gigi Radice: Lounge Chairs with Open Backs design by Gigi Radice 1950s Italy. Around: Side table by Thomas Benzten for MUUTO. On the Canal House edition of ELLE Decoration NL I have found one of the most colour constant interior ever. In the heart of Amsterdam's busy canals Studio Erik Gutter has developed a symphonic atmosphere where every room, every corner & every detail are in tune in the most graceful manner, the pinnacle of canary palette power. One solid piece of furniture that could potentially compress all that wittiness is this marvellous octagonal coffee table by Campbell-Rey in a combination of violet & yellow marble top & tapering brass legs to die for! Its shape & materiality suit a retro-contemporary design. However you shall consider to use a stroke of canary as a wall accent or in a specific piece of furniture in the room, like armchairs presented in various interior examples. 2LG Studio presents a delicious compact living with light grey+sky blue+pastel green tones with a flash of gold & in a different manner you can see that captivating shining gold carpet proposed by Isabel Lopez-Quesada in this Paris Apartment where the grey shades are made my the tones of light shades on the off-white canvas whilst the rich colour on the floor brings that canary freedom feeling. Waterloo Flat: Interior by 2LG Studio, London as seen on ELLE Decoration UK issue March 2018/ Photo credit: Oli Douglas. Paris Apartment: Interior Design by Isabel Lopez-Quesada as seen on AD Spain issue January 2018/ Photo credit: Ricardo Labougle. Gigi Radice: Lounge Chairs with Open Backs design by Gigi Radice 1950s Italy. Here suggested to be upholstered with Nouvelles vagues Col4 - Tiger eyes: Textile by DEDAR. Even though the proposed living rooms are dominated by wonderful armchairs like in this De Cotiis vacation home in Tuscany, where the armchair acts as accents to the interior, I would complement this idea with my beloved Sesann three seater in a mustard upholstering textile to add a great degree of comfort with style. Or maybe placing a fabulous Gigi Radice upholstered with Dedar's nouvelles textile to bring pattern & shine. At last I believe a way to bring spaces together with a canary's state of mind & great fashion would be placing a Minima Moralia divider between rooms adding texture & in my eyes its plissé design almost imitates the movement of the canary's wings whilst flying still. A consistent full on grey dining could not be missed at the Prinsenkracht apartment by Studio Erik Gutter, the depth & richness of the thick grey room can't be denied by the yellow details around the room. 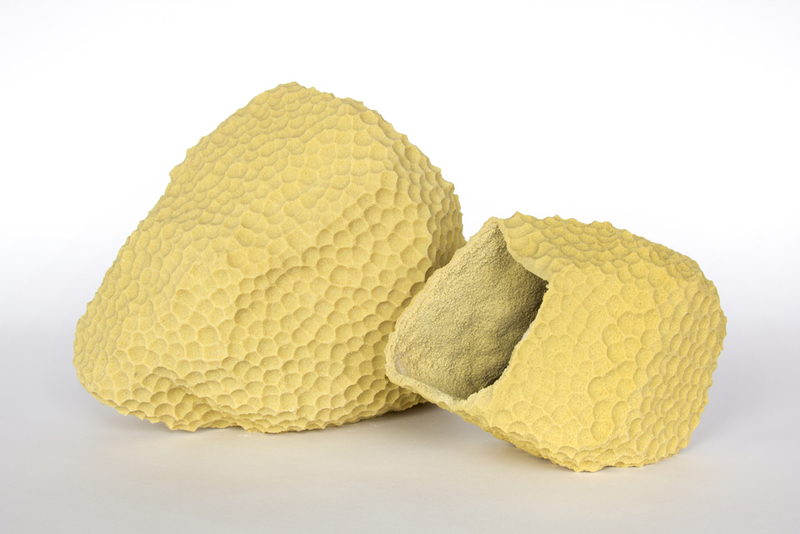 You can do so by using these super yellow vases by Steven Haulenbeek as centre pieces of on a console they will bring happiness & texture to your canary interior for sure. On the opposite side of the spectrum & in a different fashion Riccardo Barsottelli presents at Locanda del Colle, where the tones of yellow & acid green are rather predominant yet in this dining the refreshing light grey surfaces make this a canary interior too. Locanda del Colle B&B Interior Design by Riccardo Barsottelli in Toscany. Batavia: Interiot by Abaton in collaboration. Upholstered canary yellow chairs can be key for what we are looking for, they can bring a ray of sunshine to the room, like in this Abaton collaboration with Botavia therefore I propose a set of Beetle chairs by GUBI which express a retro feeling in a contemporary manner. A final touch can be floating-like suspended lamps, like the Aura that gives a sense of swinging birds, how appropriate! Lastly for the DIY lovers you can simply you can paint all random chair in yellow or perhaps a console or cabinet to add that accent to your canary dining. Our place to start the day can be glamorous or more laid back yet how wonderful can it be to have a touch of sunshine everyday as we awake? The most beautiful canary bedroom I know is at One57 Residence by DHD Architecture & Design, as every detail has been considered; grey-blue textured wall covering, light grey/silver upholstered headboard & poufs, gorgeous patterned curtains & old metallic & yellow details. Simply fabulous like this Armani Casa wall covering with what seems layers of various shiny shades of grey sand which gives that chic texture. I would strongly suggest adding this sweet pendant lights which again mimic a swinging bird like it appears to be by these C-Balls which may give just the appropriate atmospheric light ideal for the bedroom. For the once looking for a more laid back canary approach there are other suggestions like painting a yellow headboard-like wall & adding yellow throws & cushions. Further more we can also consider the floor to bounce that bright feeling with a Koloman rug with that off white soft background & silky goldish yellow pattern or perhaps with MUUTO yellow side tables to spice up the space. In either case the bedroom can present a lighted grey base & again with canary yellow accessories. Bedroom at Boerderij 2.0 as seen on Eigenhuis & Interieur issue December 2017/ Photo credit: Alexander Van Berge. Koloman: Rug by Luc Deflandre & Around: Side table by Thomas Benzten for MUUTO. E V E R Y W H E R E E L S E . . .
Leo Coolen & Susan Theunissen home interior.